San Bernardino is a beautiful southern California city with a population of some 215,000 souls. Six days after the December 2nd jihadist terrorist attack on innocent partygoers at the Inland Regional Center (RC) in San Bernardino. 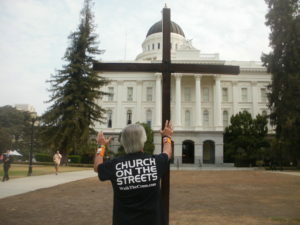 I traveled the 165 miles from Bakersfield to this city of some 215,000 souls, checked into my motel room and then unloaded the 60-pound, 10-foot cross from off the go-ye-mobile truck rack and began walking north on Waterman Avenue and toward the large IRC facility. With the large cross resting on my left shoulder, I walked on the sidewalk and against the flow of traffic, waving and smiling at reach passing vehicle. This is my normal modis operandi, and it has served me well as I’ve walked the cross in some 130 California cities since 2006. From San Ysidro and the Mexican border crossing to San Francisco and the Bay area, response at seeing a now 68 year old street evangelist lugging a large cross on his shoulders and down a busy street has always been so much more positive than negative. 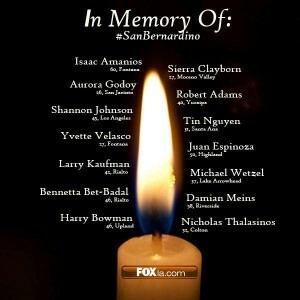 But I really didn’t know how the people of San Bernardino would respond this day. Every city I walk the cross at, I bring the large cross to each police station and pray for the safety of its thin blue line. Five years earlier, I had walked the cross throughout downtown San Bernardino, along with Pasadena, Riverside and two other neighboring cities. But my real destination then was some forty miles away and the small city of Hemet, and especially its police station. My reason to walk the cross in Hemet was because of a short but serious news story I had read in our local paper. After cracking down on outlaw motorcycle gangs that were engaged in all types of illegal and criminal activities, Hemet police officers became targets of reprisal, including the rerouting of a natural gas pipeline into the headquarters of the county’s gang task force in an attempt to blow up the building and the placement of a crude pipe bomb beneath an unmarked police vehicle as it sat outside a convenience store. Both attempts to kill and harm Hemet’s thin blue line failed, but the threats continued. After arriving at Hemet, I walked the cross to the police station and, as is my normal method, I hoisted the 10-foot wooden crux upright and began praying loud and long, asking God to protect the city’s thin blue line by surrounding police officers with His thick blue line of angelic protectors. I also asked the God of justice to expose the culprits so they would be arrested. One week later, Hemet police officers arrested the culprits, and the threat to their safety was totally quashed! 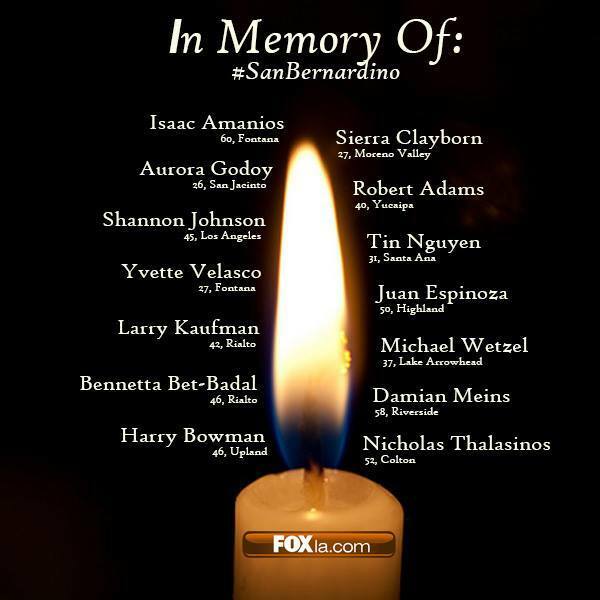 WE ARE SAN BERNARDINO TOUGH! The names of the fourteen souls slain by the two jihad terrorists. I thought of Hemet as I walked the cross toward the IRC, and how prayer really does work. Not only in Hemet, but in my hometown of Bakersfield, as well as so many of the other cities I had visited in a ten-year-period of cross walking. But how would the people of San Bernardino respond today after experiencing a totally unexpected terrorist attack on innocent civilians that had left fourteen dead and twenty-one wounded? My concern was short-lived! As I traveled down the very busy street, car horns sounded, thumbs-up signs were displayed, and “Praise the Lord! shouts rang out loudly from smiling faces inside passing vehicles. And what really got my attention was the number of people who were wearing long-sleeve tee-shirts that displayed a large arrow head (the symbol of San Bernardino County) with the words SB Strong printed inside the arrow head! Oakland is a beautiful city just eight miles form San Francisco via the Bay Bridge. If the previous day’s great cross walk in San Francisco was any indication of what lie in store for this cross walker as I traveled in the Go-Ye-Mobile-2 truck (GYM-2) from the motel room on the Peninsula and in Belmont (25 miles south of San Francisco) to the East Bay city with a population of some 420,000 souls, then some great and awesome happenings in Christ were definitely going to take place today.